We Drink Love was born out of the desire to see food cherished as a gift of God, and our bodies lifted up by its consumption. Pioneered to be completely fair-trade and organic, so that we may respect the farmers, protect the land, and provide for consumers the highest quality ingredients, all we do is from love, and for L.O.V.E. We have turned our back on the easy road to fast ‘fixes’ and dramatic results, sourcing only certified organic and fair-trade ingredients for L.O.V.E. Super9, choosing nutrition over huge weight loss, and community over cheap bargains. Working with suppliers to ensure that workers are paid adequately, and that the land they work upon is treated with care and respect, L.O.V.E. starts from the ground up, and each individual involved in its creation acts out of a place of love. This is why we are proud to share our faith as such an integral part of our products creation and promotion, for if we have all these things, but not love, we are nothing. This is why we are committed to sharing our product with authenticity and integrity, choosing to share the triumphs and the trials that are part of living out a life defined by love. Love can mean sacrifice and it can mean struggle, but love will always reign triumphant over circumstances, so that we may emerge victorious and ready to share the love with others. The inside of each box of L.O.V.E. has a secret and significant reminder to all those who have walked the L.O.V.E journey; “now that you have L.O.V.E. in you, go ahead and love others.” Inspired by the word of God in 1 John 4:11, we are constantly seeking to build support and community out of the overflow of the love we see in our lives, through the grace of God who provides it. We Drink Love is wanting to build a community of LOVErs, known by their distinctive drink bottles and marked by love: for themselves and those around them. Leading the way with simplifying how we see healthy living and eating, we will always be more than a company simply providing a detox plan; we want to provide opportunity and inspiration for a life lived wholeheartedly, that is, out of love. 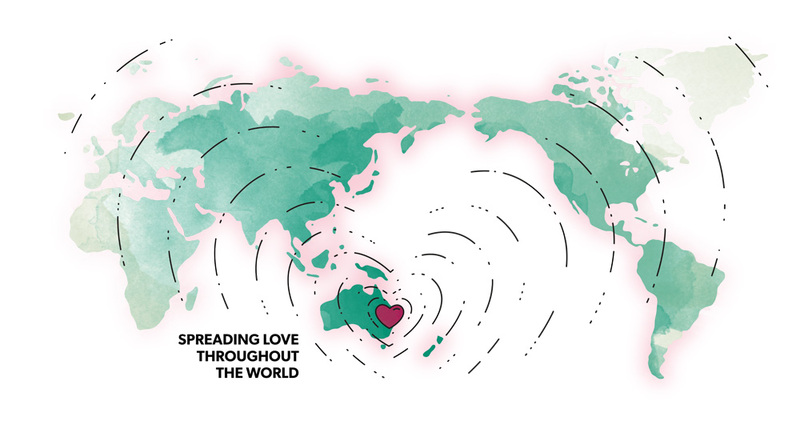 Understanding that LOVE Super9 is one part of the journey to a wholehearted life, our team is dedicated to providing our community with the information, support and guidance they need on their journey. Cultivating this community on social media, and in our Sydney store, we are the solution to those searching for an allergy-friendly product, the shoulder to cry on, and we are always the friendly face to welcome the newcomer. Not only do we genuinely care about the health of people through a premium quality product, we value the importance of sharing what God and the society has given us. We drink L.O.V.E is sponsoring organizations and individuals throughout the world that help and support people in impoverished nations. We do want to encourage those who drink LOVE and others to be inspired and share the love as well - remember you have an abundance of LOVE in you. Supefoods boast an amazing amount of antioxidants, but what good can they do if these antioxidants are destroyed before they enter your body? Not only are the ingredients RAW which have LIVING enzymes, the most sophisticated technology that preserves the nutrient value of each individual ingredient has been implemented. Not all superfood powders are created equal, and that's why LOVE is LIVING. That's why LOVE is ORGANIC. From vitamin C to beta carotene, various antioxidants that protect our cells and DNA are given unique roles such as protecting our heart, eyes, etc., which means they are not interchangeable. Since no single antioxidant will be able to perform the job of the others collectively, consuming a wide array of antioxidants becomes VITAL to comprehensive health. But consuming different types of antioxidant supplements will not provide the same benefits as antioxidants derived from wholefood, as their nature is to act in concert with other nutrients found in the food as well. LOVE comprises the most comprehensive variety of natural antioxidants in the market though superfoods that also contain a full array of essential nutrients. That's why LOVE is VITAL. Did you know that our cless are ENERGY generating factories? not only will the ingredients in LOVE feed your cells with the right nutrients, it will create healthy cells so that your cells can generate energy effectively. Maximum energy is created by healthy cells, and that's why LOVE is ENERGY.